Much like my Cinnamon Sugar Twists, I shared images of these bites online and saw some interest in them. So, I figured I'd share with you how easy they are to make. Before I get to the instructions on those goodies, bear with me as I share my meal plan and recipe review for the week. I'm linking up at Menu Plan Monday on I'm an Organizing Junkie. Cheesy Penne with Broccoli: This came together pretty quickly and was just what I needed to make after a long day; something easy and tasty. I really liked it. Delicious Ham and Potato Soup: This particular recipe has become a staple at our house. When I say that I'm making potato soup, this is the recipe I mean (my mama's recipe that I love so much is too labor intensive for me most of the time). Be warned that the chicken bullion and the ham used in this recipe make it quite salty. I recommend only adding a little salt at a time. Now for the yummies. I'm not completely sure I should share this recipe though, because these are SO EASY that you might end up making them all the time. 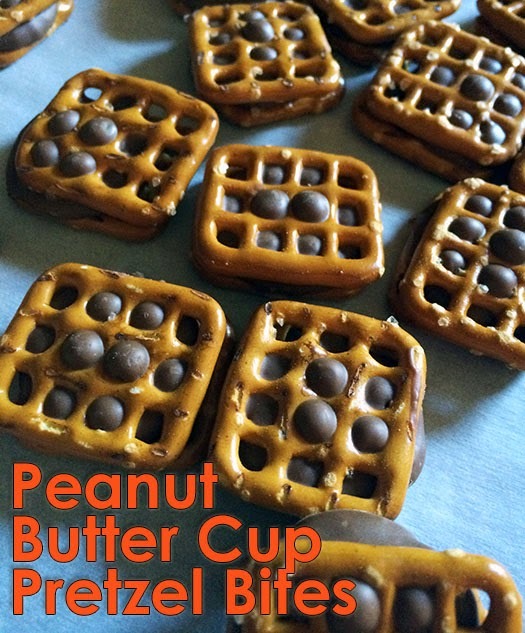 I don't want to be blamed for your new peanut butter pretzel bite addiction. If you've got a liking for sweet, salty, and crunchy like I do; don't say I didn't warn you. Heat oven to 250 degrees. Spread out pretzels in a single layer on the baking sheet. 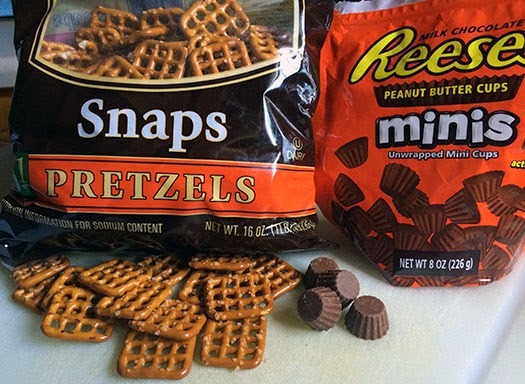 Place a peanut butter cup in the center of each pretzel. Bake for 4-5 minutes until cups start to soften. Remove baking sheet from oven and smoosh a second pretzel on top of the first. Cool bites in the fridge for about 20 minutes. That's it. Too easy. I warned you. Mmmmmmm!! 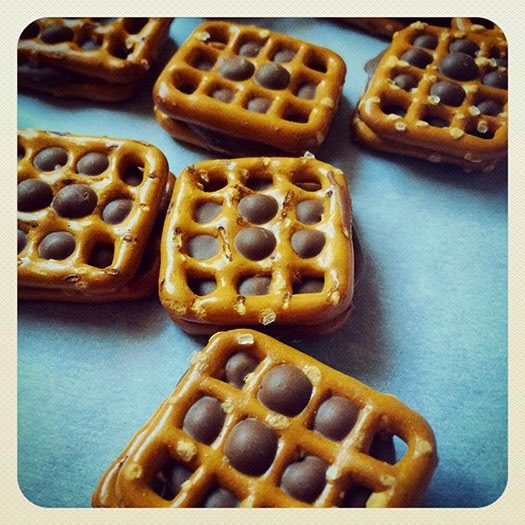 Love chocolate and pretzels together. nd YES that is TOO easy! This recipe is unbelievably easy and adaptable! Such a quick bite, wow!